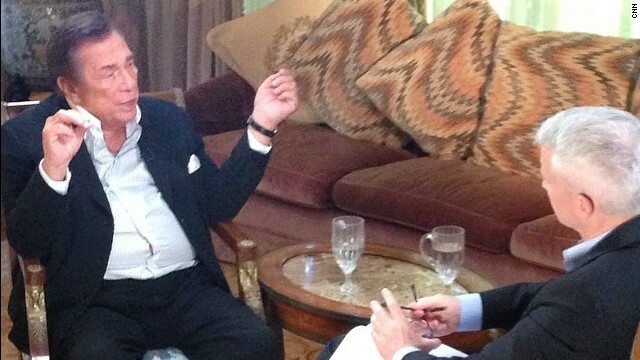 L.A. Clippers owner Donald Sterling sits down with CNN's Anderson Cooper. The owner of the L.A. Clippers apologizes for his racist comments. Michael Sam's draft day kiss ripples through the NFL and social media. And more severe weather threatens the nation's heartland. Took the bait: Los Angeles Clippers owner Donald Sterling offered an apology and an explanation nearly two weeks after the NBA fined him and banned him for life for racist remarks made in a recorded conversation. "I'm not a racist," Sterling told CNN's Anderson Cooper. "I made a terrible, terrible mistake. And I'm here with you today to apologize and to ask for forgiveness for all the people that I've hurt." Sterling said he was "baited" into making the comments. "That's not the way I talk." Public display of affection: Call it the kiss seen 'round the league. There's been no shortage of reactions to the lip-lock Michael Sam planted on his boyfriend after he became the first openly gay player drafted by the NFL. Disapproving tweets by Miami Dolphins safety Don Jones have landed him in hot water. The team has fined Jones. The Dolphins said his comments weren't consistent with "the values and standards of our program." More expected: It's that time of the year. Cold air from the north and warm sticky air from the south are duking it out over the heartland. Sutton, Nebraska, and Orrick, Missouri, took the brunt yesterday as tornadoes damaged homes and businesses. More severe weather is expected today. Folks from the southern Plains to the Great Lakes region have the most to fear, according to the National Weather Service. Independence vote: Early election results are out after Pro-Russian militants in eastern Ukraine held weekend referendums on declaring independence from Kiev. Perhaps to no one's surprise, nearly 90% in the Donetsk region voted in favor of independence from Ukraine and 10% voted against it, an election official said today. A CNN crew witnessed people casting multiple ballots at one polling station. A similar question was put to voters in Luhansk, where preliminary results were also expected today. Still missing: The international effort to find the kidnapped Nigerian is picking up steam. U.S. and British officials are in the capital of Abuja to help look for the girls, plan rescue missions and advise on ways to quash the terror group. China and France are also helping in the search. In addition, Israel plans to send a team of counterterrorism experts to help, President Goodluck Jonathan's office said yesterday. There are few details on the international community will provide, but the United States has said it has no plans to send combat troops. –Baby baby: Mom delivers rare twins on Mother's Day. - Hoppy times: It's a cute bunny eating raspberries. What more do you need to know? - Hippest ship: Talk about earning your stripes. The cruise ship MSC Magnifica blasted out "Seven Nation Army" during the Hamburg Port Anniversary Festival in Germany this weekend. - Kitty cuddles: Here's a cat that loves a good hug. - Major save: Watch this trucker avert disaster with a clever maneuver. The gold-digger herself told Barbara Walters that she didn't think Sterling was racist. That should be the end of the story. But then, the NBA would have a problem for firing Sterling, wouldn't they? How is it OK for a male football player to kiss a woman but a man not to kiss another man. Something is wrong with the century you are living in. I'm sorry, but the whole "I was tricked into saying that" argument is hogwash. Every day millions of people escape sting operations by doing only one thing: not being bad guys. If you hadn't thought it and felt it, you wouldn't have said it. I've got an uncle who insists that his dislike of Obama has nothing to do with race, yet somehow manages to say at least once in any and every conversation about the president, "It's high time we put white back in the White House." And then he laughs. You see what he did there? You get it? "White" back in the "White House?" It's clever. It's funny. No, it's racist. So's my uncle. So's Donald Sterling. It's taken Donald Sterling nearly two weeks to offer this rehearsed,transparent, shallow apology? It's a little too late don't you think? Just pay up and sail off into the sunset. What's $2.5 million? And as for Michael Sam kissing his boyfriend. He has the right to express his happiness after being selected in the NFL draft.Congratulations!!!!!!!! Would it be asking too much to have at least 1 postive uplifting stories to start my day? Good morning and happy Monday, Jon.